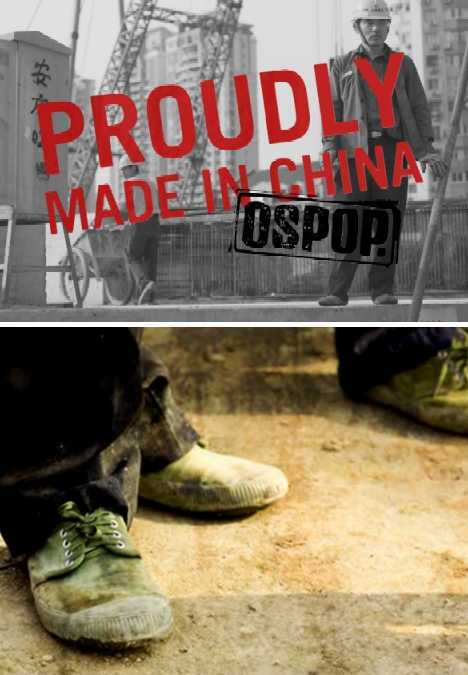 OSPOP, which stands for “One Small Point Of Pride”, is a global fashion brand inspired the hard-working people whose labor actually built the People’s Republic of China. 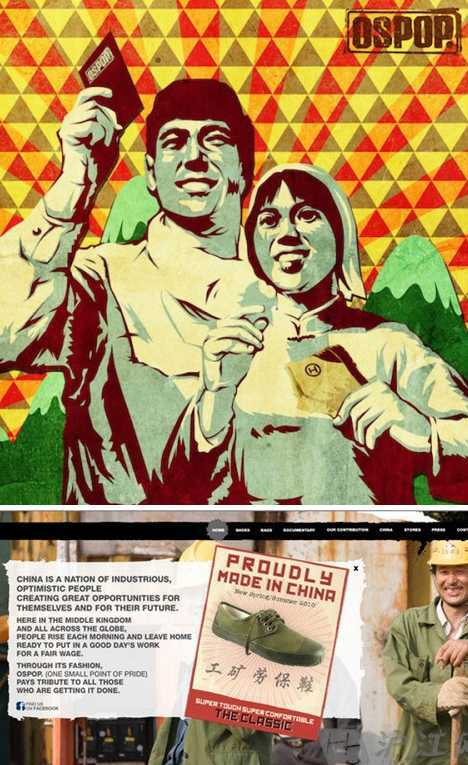 The company’s eye-catching advertising thrust makes a big point of channeling post-war China’s propagandistic art through the prism of modern multinational marketing. OSPOP was found by Ben Walters (above), a New Jersey native who first came to China in 2003. While Walters’ stated mission was to help strengthen business connections between U.S. plastics companies and their Chinese suppliers, he used his spare time exploring the very different world around him. Based in Xujiahui, a thriving shopping and entertainment district of Shanghai established in 1994, Walters soaked in the atmosphere like a sponge. Shanghai was in the midst of a massive construction boom at the time and Xujiahui was especially bustling. Chinese construction has always been a labor-intensive endeavor; it seemed to Walters that everywhere he looked he saw Chinese construction workers sporting similar work clothes. Their shoes were especially noteworthy, differing markedly from the massive steel-toed work boots favored (or mandated) by heavy laborers in the United States. 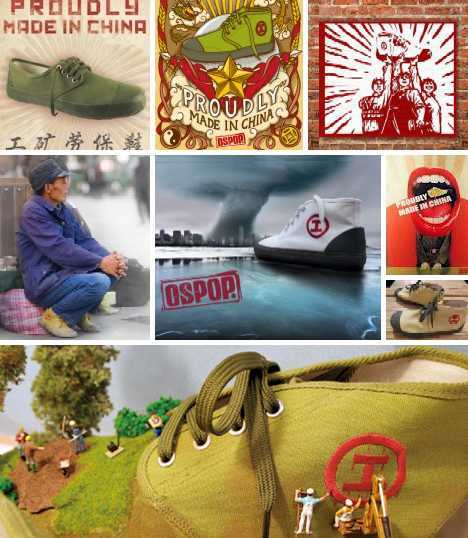 A little research revealed the lightweight, canvas, rubber-soled shoes to be Jiefang Xie – “Liberation Shoes“. 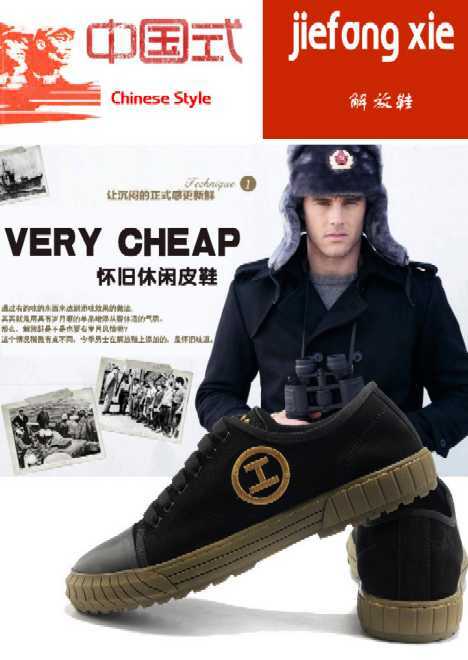 If the name smacks of Maoist sloganeering, attribute that to the shoes’ origin decades ago when China was a very different place. The country’s communist central planners had to find a way to clothe and shod not thousands or millions of workers but hundreds of millions, and the consequences of them all cursing their blistered feet was simply unthinkable. 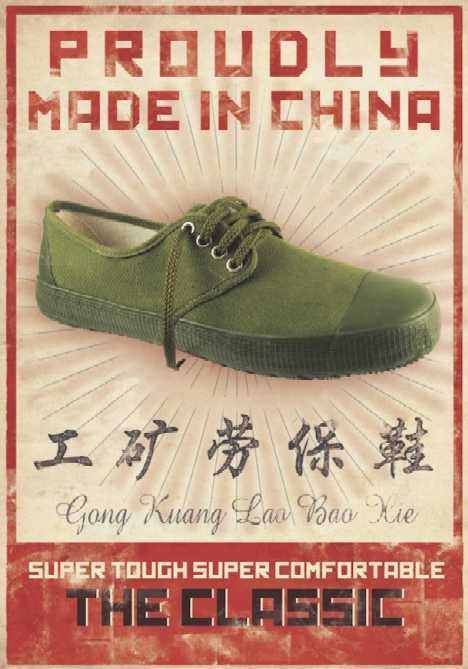 Give credit to Mao’s central planners for doing something right, and give thanks the shoe factories didn’t crank out only right shoes to boost their production totals (as happened on occasion in the Soviet Union). On the contrary, the Jiefang Xie was so successful it’s managed to make the jump from Great Leap Forward-era China to Deng Xiaoping’s “to get rich is glorious“ China. To Ben Walters, the lasting popularity of the Liberation Shoe stuck out like a sore thumb… or sore toe, as the case may be. 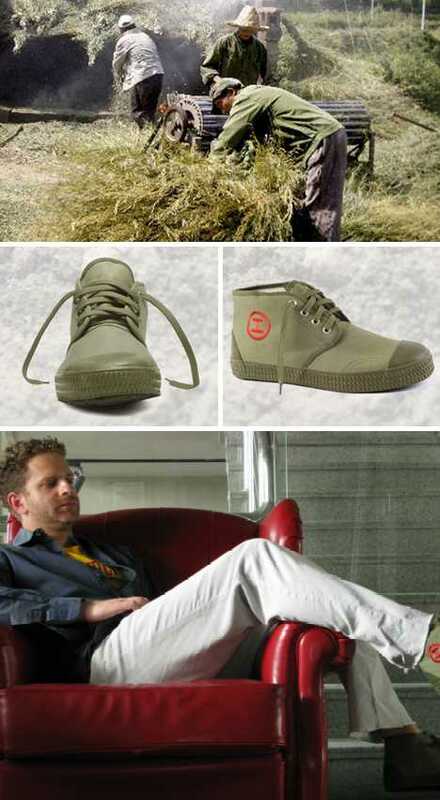 Tried and tested in China’s most unforgiving work environments, the back-to-basics shoe could easily catch on overseas with a tweak here and there to suit Western sensibilities. 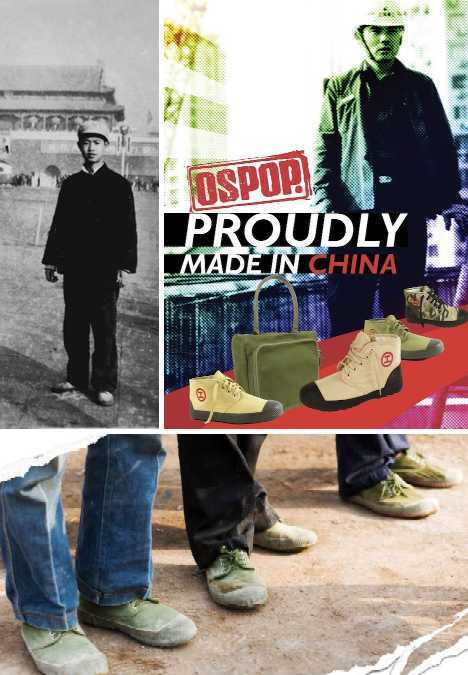 So it was that OSPOP (“One Single Point Of Pride”) was born, with the company contracting production out to a shoe factory in Henan province that was already experienced in cranking out the original Jiefang Xie. Those tweaks we alluded to included better-quality materials all around, ergonomic insoles, double-vulcanized soles and an extra pair of laces – one matching the uppers, the other complementing the soles. Encouraged by the success of the revamped Liberation Series, OSPOP expanded its shoe lineup to the high-topped Skywolf series, the wider color palette of the Departure series, and the more substantial, wool-lined Steppe series. 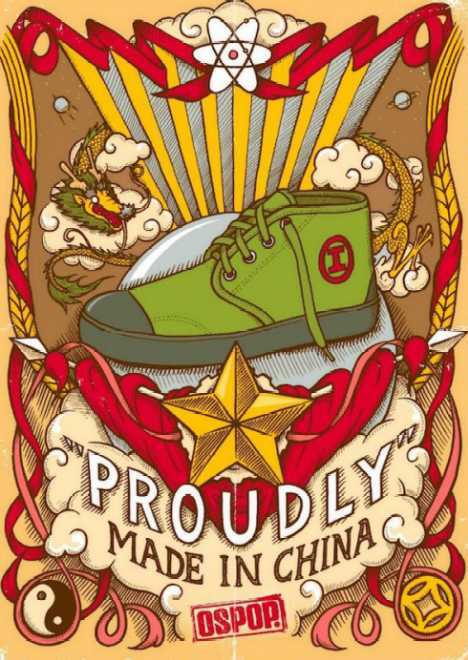 All high-tops boast a distinctive red “Gong” character, which means “Labor” in Chinese. 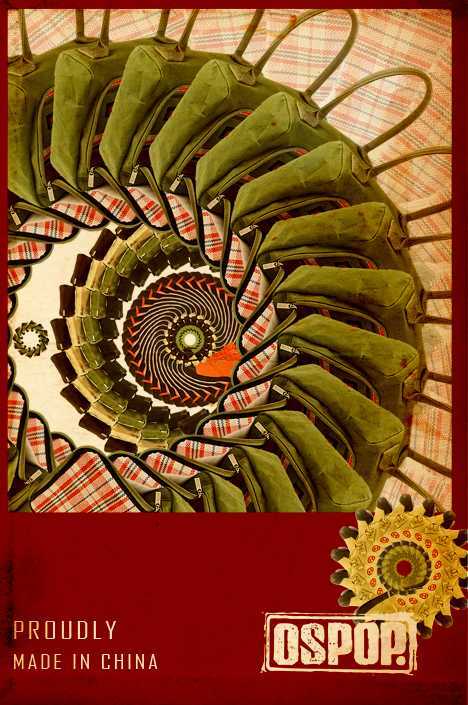 A further expansion of OSPOP items saw the advent of the Migration Series messenger, one-handle and toiletry bags. Featuring water-resistant, time-softened canvas outers in a range of earth tones, the Migration Series gets its name from their red white & blue woven plastic “She Pi Dai” linings. The ubiquitous “snakeskin” fabric composes the light & durable storage bags favored by tens of millions of Chinese migrant workers when traveling to and from their rural home villages. 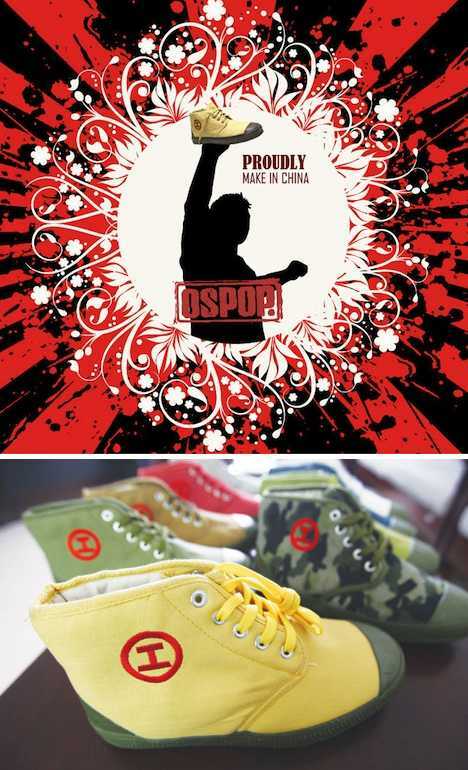 The success of OSPOP outside China has led Ben Walters and his management team to look inwards – though OSPOP’s revamped classics sell for much higher prices than their inspirations, China’s upwardly mobile fashionistas have got the funds to spend along with a burgeoning sense of pride in their nation’s accomplishments. 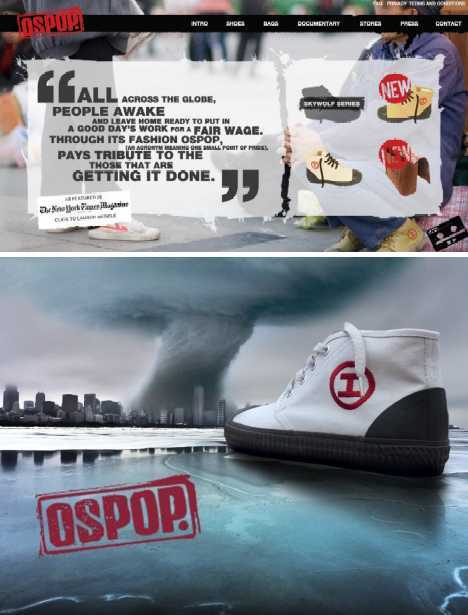 Another motivation is the increasing amount of counterfeiting: imitation may be the sincerest form of flattery but besides being a form of theft, the flood of OSPOP fakes reflect lost opportunities for OSPOP itself. 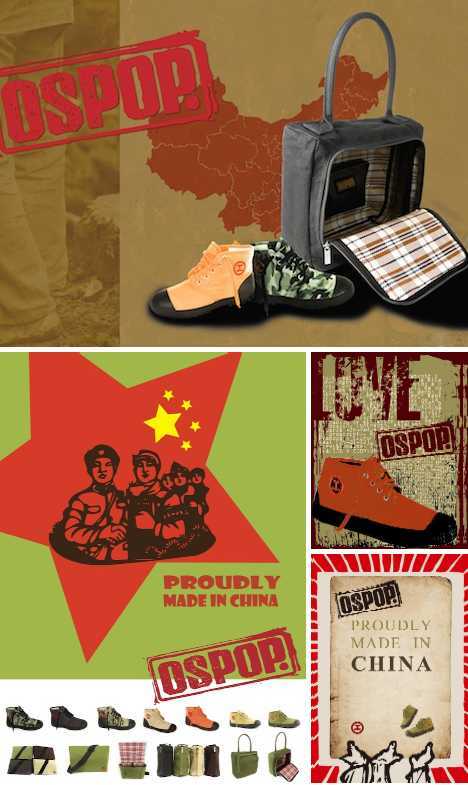 The opening of OSPOP’s online store at Taobao, China’s largest internet mall, is one way OSPOP’s fighting back against its imitators… the store’s URL wasn’t dubbed “The Real OSPOP” for nothing! 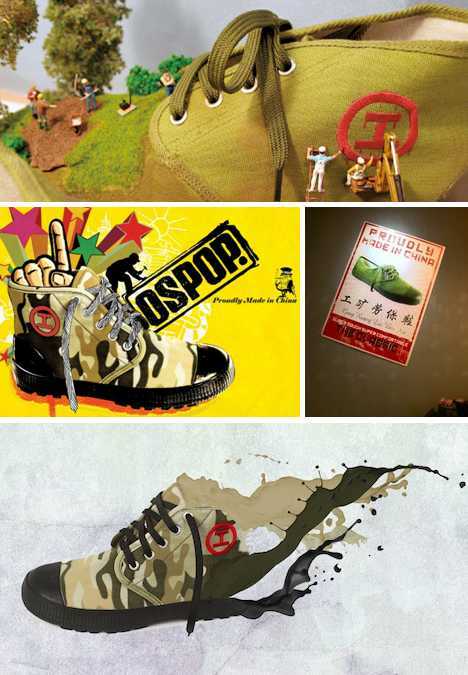 In conjunction with the Taobao store’s opening and as a way to boost its brand identity, OSPOP hooked up with Shanghai-based NeochaEDGE in sponsoring a crowd-sourced poster design contest. 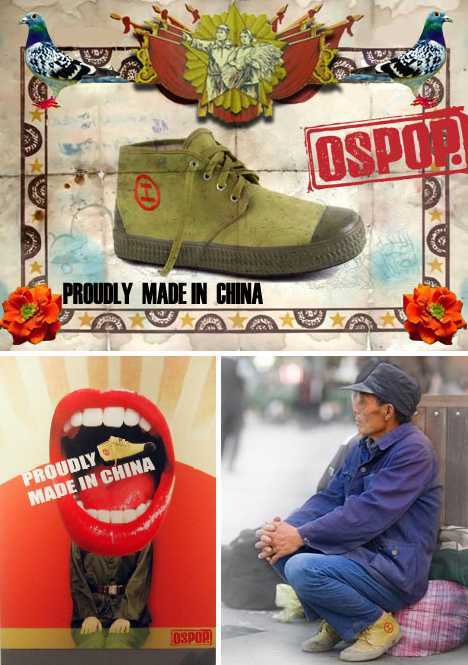 Artwork espousing the theme “PROUDLY MADE IN CHINA” is prominently featured in the post you’re reading. 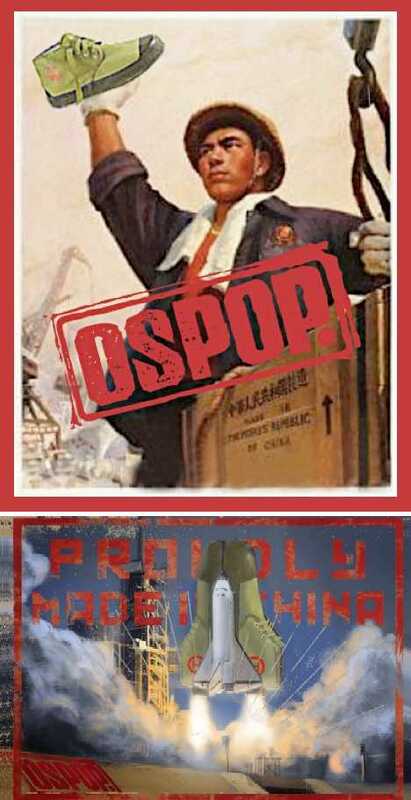 One might wonder what the late Chairman Mao Zedong and the reactionary Gang of Four might think of the poster challenge… then again, their chagrin could very well be tempered by a sense of pride. 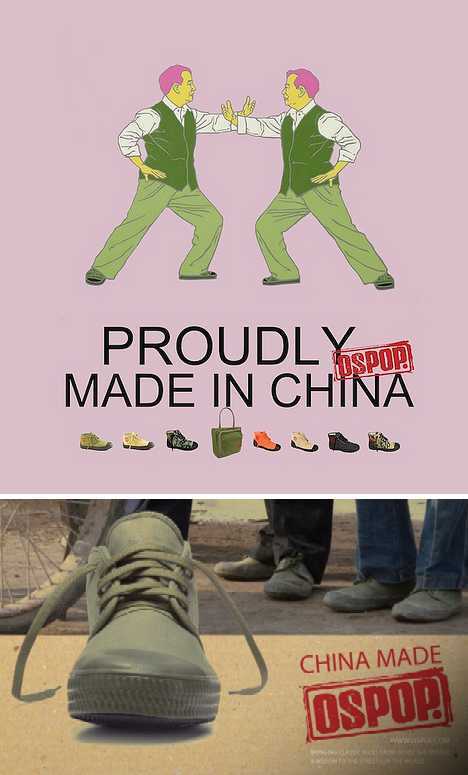 China’s come a long way since the dark days of war, revolution and struggle, and undoubtedly much progress is yet to come but who could have foreseen China’s legendary proletarian shoe striding across the world’s stage? Walk a mile in their shoes and feel the weight of history, you might just get a kick!